Natural England has now secured funding from Defra to continue with the improvements within the Avalon Marshes. These are at the Avalon Marshes Centre and are part of what is known as the Phase 3 works. They will be carried out between Monday 28th January and approximately mid-March. During this period Somerset Crafts, The Marshes Tea Hub and the information point will continue to fully operate. However, part of the car park will be closed and the vehicle and pedestrian entrance will be moved to the northern end of the centre (the Westhay end). The detailed design to finish all the main improvement works at the centre (these are a scaled down version of the previous design). Drainage, fencing and landscaping around the replica building area thus transforming it. Paths, landscaping and car park improvements at the Shapwick Heath end of the centre (this extends from the main entrance, past the replica building area up to the Craft Centre). Subject to funds the last element will be the removal of the life expired classroom. This will allow the South West Heritage Trust to push on with the completion of the replica building area. A temporary classroom will be provided elsewhere at the centre. What next? 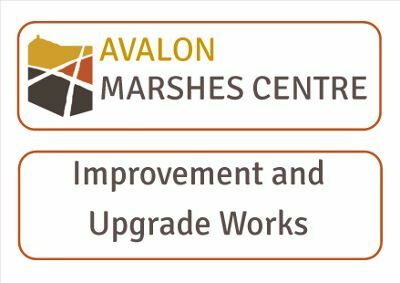 Natural England and its partners at the Avalon Marshes Centre are keen to push on with the improvements at the centre and build on what has been achieved with the recent Defra funding. The funding climate is very difficult but hard work is going on behind the scenes to secure further funding.